The Point Supper Club is also noted for its fine wines. The Point Supper Club is located mid ship on the Carnival Conquest's Panorama Deck. There is a 35 USD charge per diner which covers the gratuity at The Point Supper Club. Reservations are required, and there is a dress code. A sample menu for The Point Supper Club is available at our Carnival Cruise Menu guide. Reservations are a must! We strongly suggest that you book your reservations when you complete your online check-in process before leaving for your cruise. While you can make reservations when you're aboard the ship, your selection will be limited as early bird online bookers have already taken the choice seating times. The Point Supper Club is usually sold out within the first two days of the cruise. The Point Supper Club is only open for dinner. The operating hours of the Point Supper Club are from 6:00pm to 9:30pm. The Point Supper Club dress code: Gentlemen are required to wear jackets. On formal nights, you should follow the formal night dress code. There is no smoking in The Point Supper Club. The 35 USD per diner cover charge includes gratuity. Specialty drinks, beer, wine, and soft drinks can be purchased from the current bar menu. How much should I tip at The Point Supper Club on the Carnival Conquest? First, bear in mind that all alcoholic beverages that you pay for will have a gratuity added. The cover charge does include gratuity, however, you may wish to consider giving an extra gratuity to the waiter or waitress who has served you. An appropriate amount is to estimate the value of the meal you ordered if you ordered it on land and tip 15-20% based on that cost. If you feel that the value of the meal was $50 were you to order it in a land-based restaurant, you should tip $7.50-$10. It is certainly your discretion not to tip, but the waiters serving you are some of the best on the ship and should be rewarded if they provided you with an exceptional dining experience. 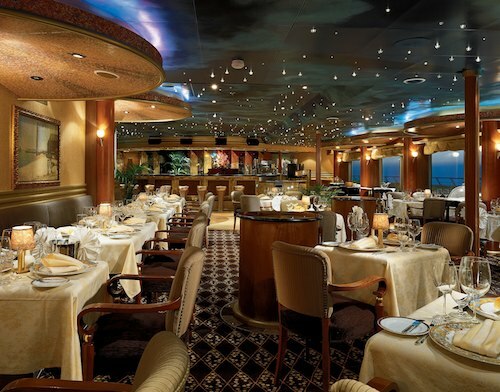 This restaurant is also known as The Point Steakhouse on board the Carnival Conquest.